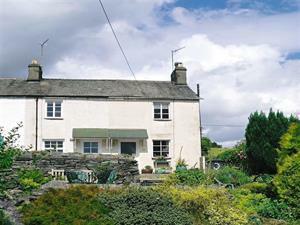 Honeypot Cottage Self-cateringA charmingly renovated early Victorian cottage with south-west facing views across the valley towards Loughrigg and Coniston Old Man. Honeypot Cottage will be a cosy base to return to at any season of the year. The centre of Ambleside with its restaurants, bars, park, bowls, tennis and excellent cinemas is within a short walking distance, less than half a mile away. The cottage is the middle one of three in a short terrace end-on to the road. This ensures it stays warm in winter and cool in summer. Honeypot is a perfect base for walking with many excellent and varied walks from the door and there is a pretty lawned garden and patio area for relaxing on warmer days and watching the sunset in the evenings across the fells. Fields behind the cottage come right down to the kitchen windows with sheep often grazing there. Accommodation: Front door gives direct access to the living/dining room (TV, DVD, radio/CD, living flame gas fire). Lakeland stone fireplace. Neat, well-planned fitted kitchen plus hanging space under the stairs for coats and walking boots. Upstairs are two very pretty bedrooms - one double and one twin with ample cupboard and wardrobe space, and the bathroom has bath with shower over, basin and wc. Fitted carpets throughout and the furnishings are comfortable with careful choice of fabrics and colours to give a charming cottage atmosphere. All the windows are double glazed and there are window seats in the living room and bedrooms. Gas fired central heating. Outside: There is a sunny patio with garden furniture and lovely views over the fells, leading to a pretty lawned garden. Private parking for one car within the gates. Short downhill walk to village centre less than half a mile. Sorry no pets * Wifi not available * non-smoking * duvets/beds made up for arrival * gas cooker * dishwasher * auto washer/dryer * fridge/freezer * microwave * gas central heating * all fuel included * private parking for one medium-sized car * travel cot and high chair available - please order * towels available - please order. A charmingly renovated early Victorian cottage with south-west facing views across the valley towards Loughrigg and Coniston Old Man. Honeypot Cottage will be a cosy base to return to at any season of the year. Private parking for one medium sized car. Children welcome from any age. Honeypot Cottage offers weekly bookings starting on Saturday. Honeypot Cottag offers weekly bookings starting on Saturday.